Calla and a Blank string - 2 string Bali Sterling Silver Mother Bracelet with Birthstone Crystals before and affer CALLA. Shown with an upgraded Heart Toggle Clasp (hard to see the heart). This is a two-string bracelet. They put their daughter's name on the first string CALLA and added free birthstone for March before and after her name and then they added a blank string. The price is per string. You may have up to 5 strings. This bracelet comes with a free lobster, toggle or slide clasp. I recommend a slide clasp with 3, 4 or 5 string bracelets. The letter blocks are 5.5mm .925 sterling silver with a letter on all 4 sides. The beads are all .925 sterling silver. I have included large decorative Bali beads and alternated between 6mm smooth round and 5mm smooth round sterling silver beads. Up to 9 letters are free, per string! 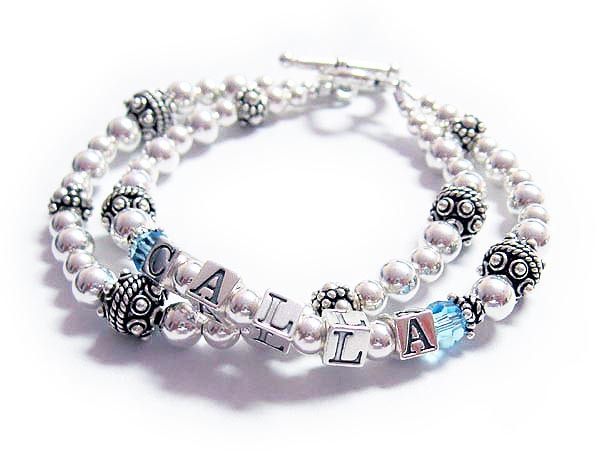 Elin, Ella and Emma - 3 string Bali Sterling Silver Mother Bracelet. 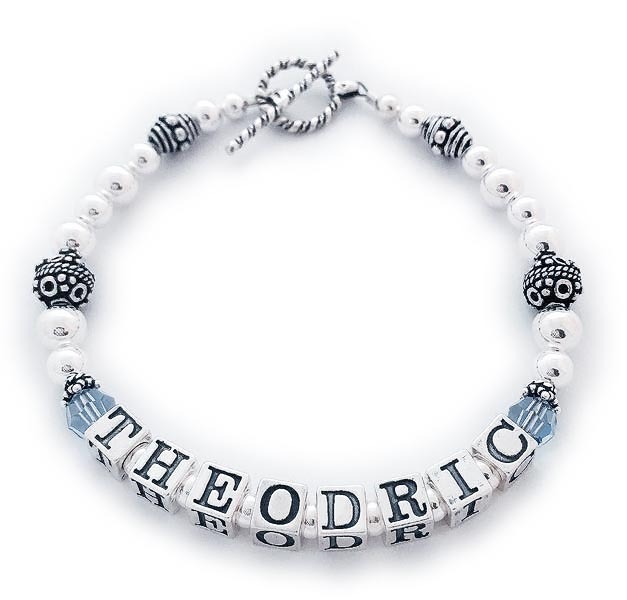 THEODORIC 1-string Bali Bracelet shown free Birthstone Crystals before and after THEODORIC. They chose the free Twisted Toggle Clasp.